Well, actually, I was given the name Archibald… (Pretentious much?) But you can call me Archie. 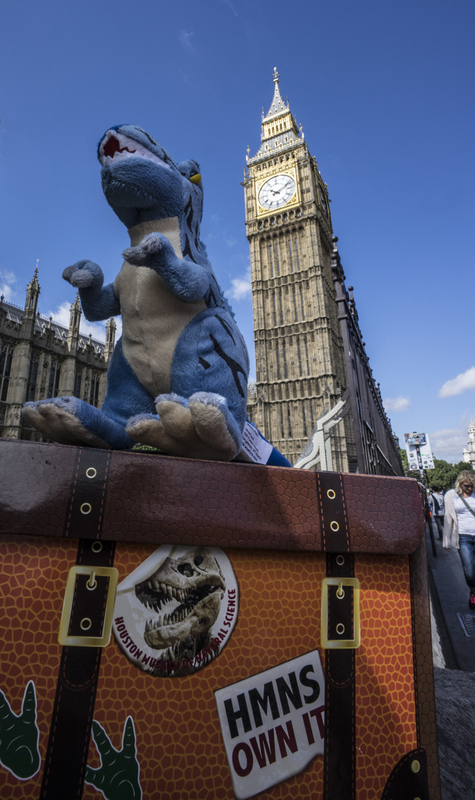 While my cousins and friends all waited to be adopted, I packed my suitcase (let me tell you, not so easy with short arms) and began my new life. A life filled with far off places, daring swordfights, magic spells, a prince in disguise… eh, maybe not so much. Let’s just say my human watches a little too much Disney. To celebrate, my new family and I went off on a summer vacation! 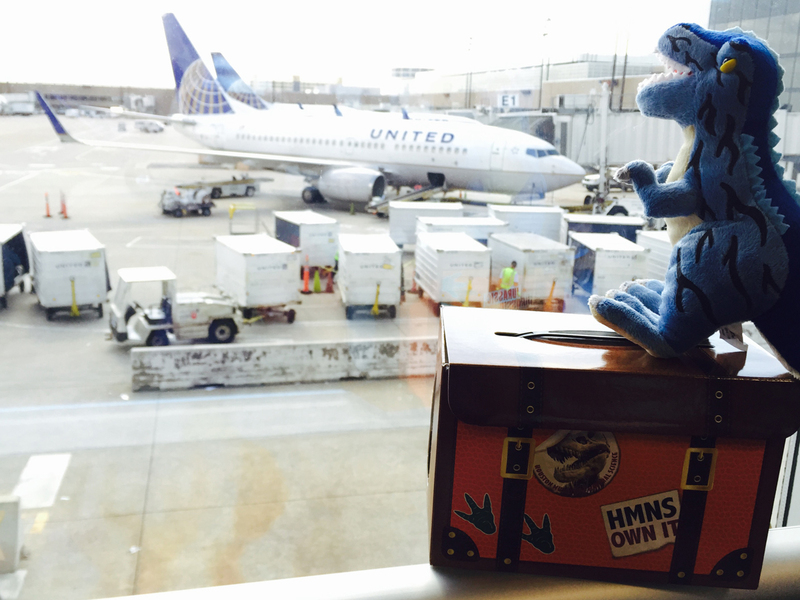 I did worry about the airplane, I mean flying dinosaurs….it’s not natural. But luckily everything went smoothly. The food wasn’t great and all, but I did get to catch up on some movies, and they even gave me some wings! I’m telling you, wings on a dinosaur… Not natural. Before I knew it, we had set down in Merry Ol’ England. Did you know they have a queen and princes (I wonder if they are in disguise), but no king? Guess I’m the king around here! London is such a busy city! Taxi drivers zooming in and out, people filling the sidewalks, lines of big red buses everywhere. 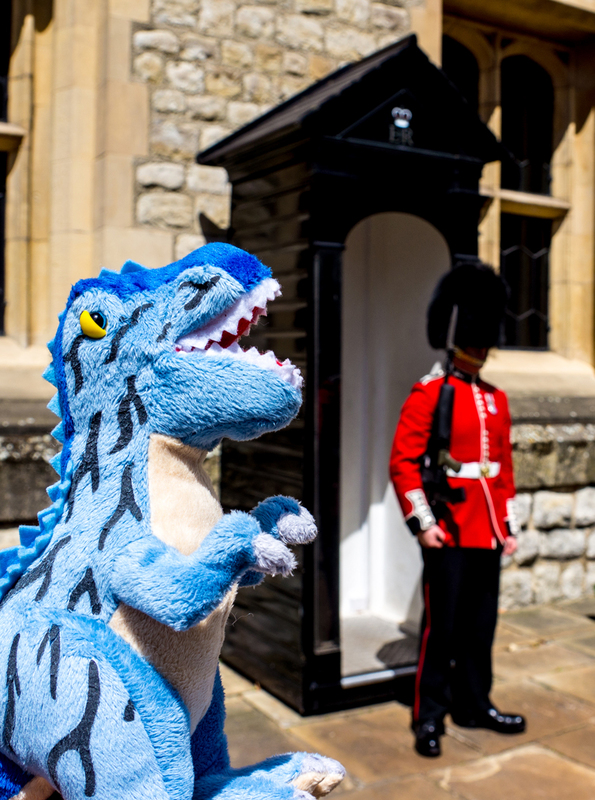 There was so much to see and do: from walks in St. James Park and Kensington Gardens (and ice cream), to Westminster Abby, Buckingham Palace (and ice cream), St. Paul’s Cathedral, LEGOLAND (and ice cream), and more (plus more ice cream)! The adventure never stopped! Here are just a few highlights from this great country. 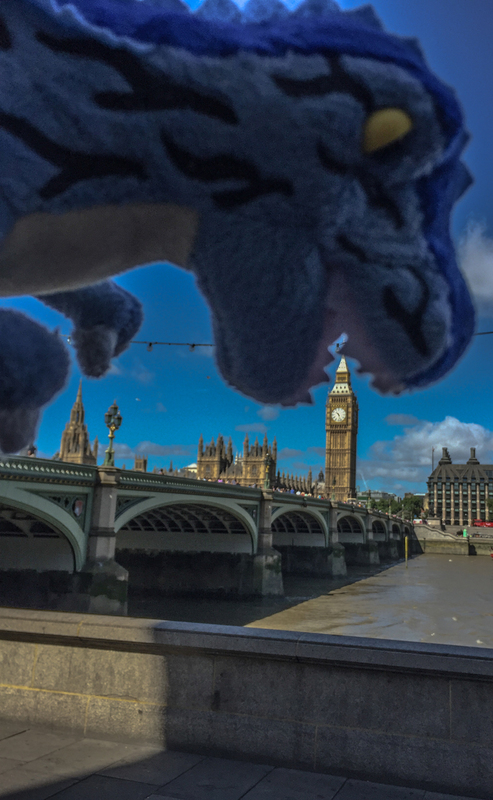 There was this old clock that everyone was taking photos with… Big Ben, I’m told. Do you think I can get people to call me Big Archie? I won’t lie; for a clock, it was pretty spectacular. I reminds me of the Chronophage back home at HMNS. OM NOM NOM!! Look at me, I’m eating the clock! Godzilla IRL! LOL! 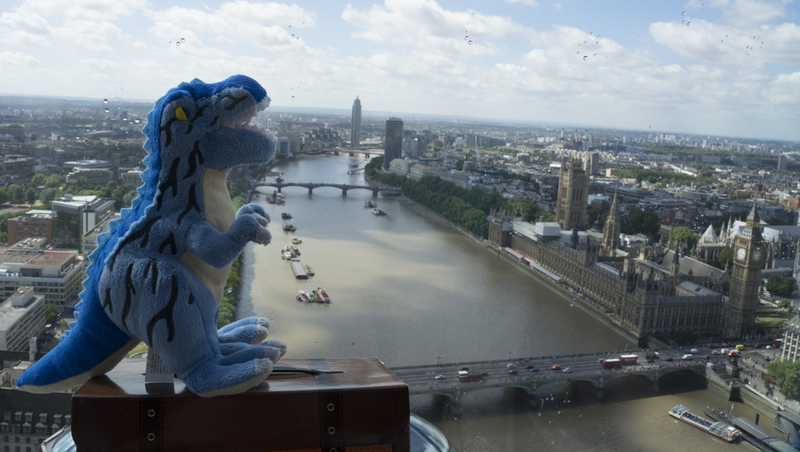 JK… Then we went on this giant Ferris wheel called the London Eye. 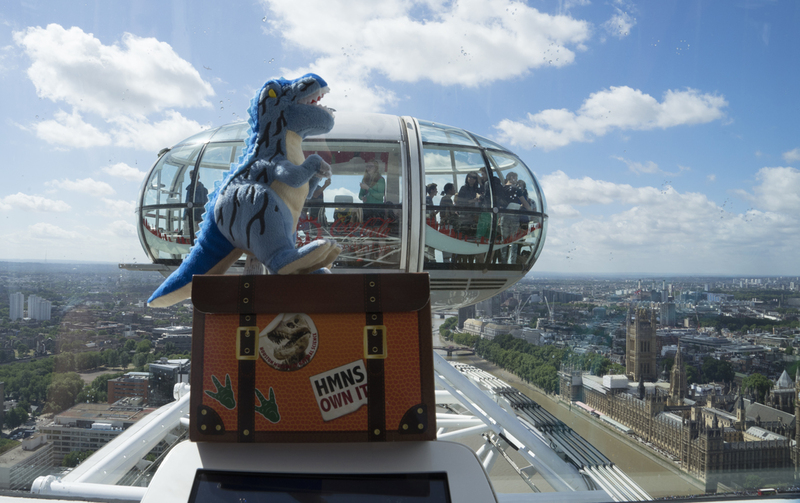 We got a really cool bird’s-eye view of London, but for some reason people kept taking photos of me, even people in the pods next to us. Guess they had never seen a blue dinosaur before. It ain’t easy being blue. Hey look, there’s the clock thing again! See it to the right? 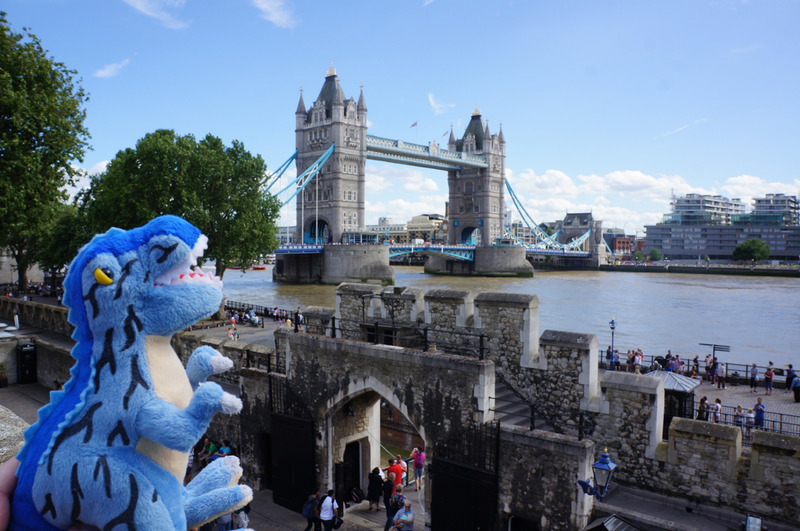 I even went on my first boat ride down the Thames to see the London Bridge (eh, not that impressed…) and the Tower Bridge (now THERE’s a bridge! ), where we ended up at the Tower of London. You’ll be happy to know that the ravens were present and accounted for when I left. I did try to eat a few, but since apparently that would have been disastrous to the realm of England. They kept them pretty safe. What do you think, would I make a good guard? 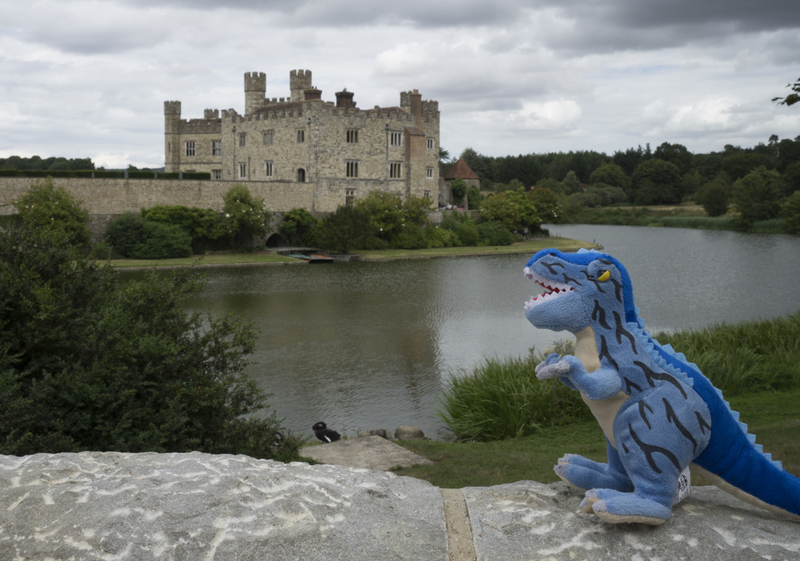 (I’m pretty good at standing still…) We did leave London to go out into the country to visit Leeds Castle in Kent, which was amazing! I mean, it has a moat. Who doesn’t love a moat? 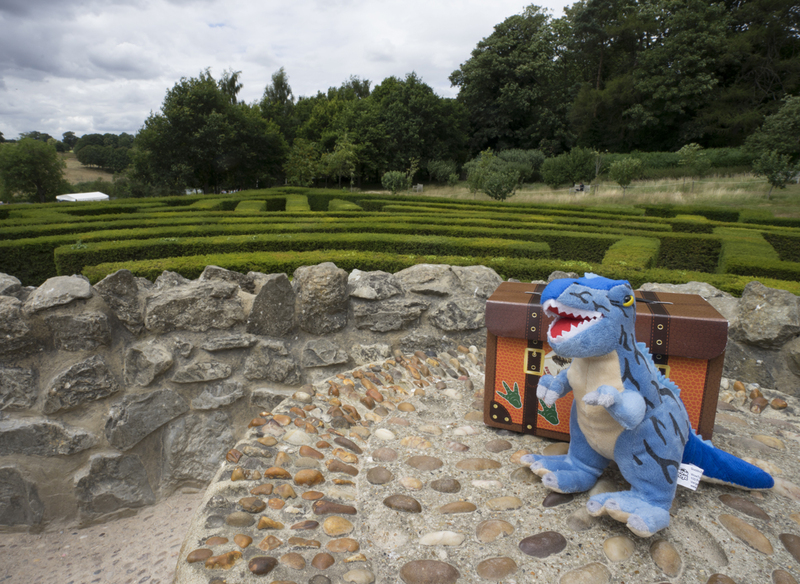 There was a tricky maze, which is not easy when you’re nine inches tall (Ok, eight and a half, but who’s counting? ), but I didn’t let it stop me. Here’s me in the center of the maze! 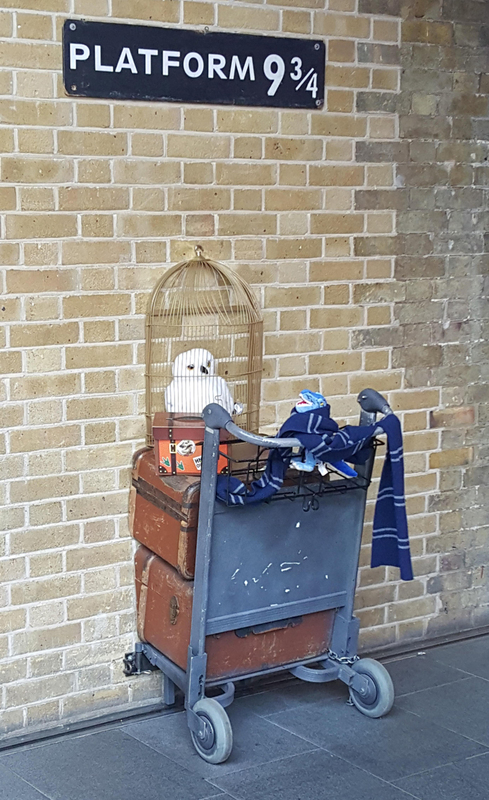 My final adventure in England was at King’s Cross Station where I journeyed onto Platform 9 3/4. They even sorted me into a house, Ravenclaw… They seemed to think it was where I belonged before I ran through the wall. Hmmm, magic, princes, a far off place… All we needed was a sword fight. Maybe my life is turning out like a Disney film, after all. Speaking of Disney, tune in again in a couple of weeks as I tell you about my adventures in Paris that includes a trip to Disney! As for this trip to England, that’s about all the stories I have to tell. Until next time! Oh, I almost forgot. I’ve got a big family still waiting to be adopted at the HMNS Museum Store! Stop by and meet them all, including my big brother! If they’re lucky, maybe you’ll take them on adventures, too! Editor’s Note: Karen is Birthday Party Manager in the HMNS Marketing department. Previous Post Registration deadline approaching for HMNS awards and scholarship!